When my mother was in college she was a commuter who went full-time—six classes each semester. It was a three mile walk each way, everyday. My mother also held a full-time job and when she came home was still able to find time to be a participating member of the large family she belonged to—doing chores and helping with the little ones. I can quite easily call up these facts, since they are engraved in the inside of my skull, worn into the bone from years of echoing and re-echoing in my ears. A little to the right of these words is the phrase: “You college students are living in an ivory tower.” Quite understandably, her experience has left her with little sympathy for the woes of the cushioned on-campus student. And all of us have had to endure the regularly recurring post-dorm life de-programming lectures from Mother. Thanksgiving, Christmas, spring break and summer vacation are now designated “re-orientation” times for college students in the Franzonello household. They are a time for getting back into the swing of family life—the pressures of which we never felt in the dorm. True, dorms have households, Advent Angels, Fove and Communio—but they could never take the place of doing dishes, folding mountainous loads of family laundry or changing a really disgusting diaper. “You are not a guest in this house! You must be a participating family member,” my mother would bark in a voice that stopped our eyes mid-roll when we got assigned a chore we deemed too bourgeois for our elevated status as college students. We were no longer in the soft safe-haven of the dorm. I know well the struggles of the collegiate, having been ploughed over by them myself. But the challenges of life since often make me long to live again in a cute little room which requires very little cleaning, shower in a bathroom I don’t have to clean at all, eat food that I don’t have to shop for, prepare or put away afterwards, and spend my days pursuing knowledge or pleasure. To me the idea of having even one whole hour, never mind countless hours together, to do nothing but read, write and study is an almost unimaginable luxury! What freedom not to have children to bathe, floors to mop, yards to mow, walls to paint, or electric, gas, water and grocery bills to pay! What great shape I would be in if I could walk into the fieldhouse at whim, flash my student ID, and stay ‘till—whenever! The social life I could have, and no babysitters to pay for!2 The only improvement I could wish for in this scenario would be to have it set in a 14th century Carthusian monastery in a picturesque Austrian village. Beholden to none. I would greatly enjoy living that way once again. The ivory tower appeals powerfully to me, but I am afraid a prolonged stay would prove quite dangerous to my soul. I could easily become selfish having no one but myself to take care of day in and day out. I might be tempted to whine about assignments, tests and papers as cruel and unusual tortures inflicted by unrelenting professors—forgetting I had voluntarily paid the tuition to go to class, or that someone else had sacrificed much for me to be educated. Nestled comfortably in a small campus might desensitize me to my father’s forty-minute drive to work and transform the short walk to the classrooms into the Trail of Tears. I might break down and cry in the cafeteria food line, not seeing just the right thing to satisfy my sensitive stomach, because I didn’t remember that Mother made only one thing for dinner each night—and I ate it whether I liked it or not. This attitude is almost impossible to maintain if you are a truly participating member of a family. In order to survive (at least in my family) you must acknowledge that there are others whose needs must be met also, often before your own. Counselling peers on relationships and study habits is very worthwhile, but you are more in touch with the “real world” when you are serving people of all ages, often in very tedious, mundane ways, as you do in family life. You are often called to service deeper than lending a formal dress to a girlfriend in dire need, or spotting someone 50 cents at the coffeeshop. We must nourish the homes which, filled with strong, healthy families, will breathe life back into this withering nation—something that buildings packed with self-centered individuals can never accomplish. I don’t mean to put down those living in the dorms here or on any college campus. I hope my humor has not been misconstrued as cynicism. I do not believe that Franciscan University’s residence halls are overflowing with insensitive souls; I know that many participate in various works of mercy and other outreaches, and pray fast and furiously for others. However, I do think it is important for students to be aware of the moral perils involved in their artificial, sheltered setting. 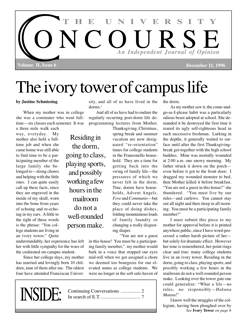 Justine Schmiesing, Concourse Design Editor, graduated from FUS in 1993.